I’m looking at buying a new PC. I’m a former bankrupt, so if I want to finance something, my options are pretty limited. I was going to try to save up for 4 or 5 months and then try buying one outright, but then I found out that this company called MDG would allow me to finance a PC. In short they’ve offered me a 28.9% interest rate on a $2200 mid-range PC. I’m horrible with calculating interest and knowing what is good and what isn’t, given how long I’ve been out of the game of borrowing. There are no restrictions on the payback, I can take up to 7 years to pay it back if I want, but what I’d like to do is pay it off within 1 year. I am hoping that financing a PC would have two advantages; one, I can get my PC right away. And two, it would help me to continue improving my credit score. The question she asked raises some interesting questions regarding the pros and cons of financing a major purchase vs. saving up for it. What would you do in this situation? This situation is not uncommon for those that have recently been through bankruptcy and there is no simple answer. Fortunately there are tools out there that you can use to weigh your options. For example, I created a simple financial calculator for this post that you can find in the files section of this blog. The calculator lets you compare debt financing to saving. We’ll use the example above to illustrate. 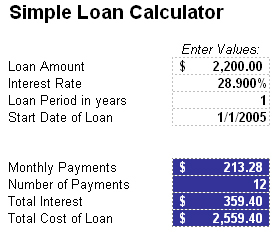 Plugging the facts of the situation into the calculator and assuming that she would like to pay off the computer within one year, it will cost her an additional $359.40 in interest over that one year term at a 28.9% interest rate. In addition, to pay that amount off within a year you would need to make monthly payments of $213.28. But before we condemn this way of paying for the computer let’s look at what it would take to save $2,200. 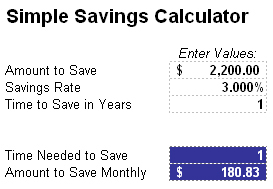 If our computer buyer were to decide, instead, to save up her pennies and then buy the machine later, she would need to save $180.83 each month in order to buy the computer in 12 months. Is a year too long to wait? If you’re like me and need it a bit sooner, it’s going to take $364.38 a month to purchase the machine in 6 months, assuming you’re stashing your cash into a 3% savings account. So what’s the verdict? Well, that’s completely up to you. I’m not going to tell you what to do but hopefully you can use the simple financial calculators shown here to help come to your own conclusion. I will tell you that it is important in a situation like this to consider the difference between needs and wants. Even if you could put off your “need” for such a computer for 3 months you would be saving yourself some considerable cash but putting a bigger down payment on the machine. Personally, I hate interest. Interest is the enemy that doesn’t eat or sleep but follows you 24 hours a day, 7 days a week, 365 days a year until you kill it. So my advice is to avoid paying interest at all costs – especially anything around 28%! If such a purchase is indeed to increase your credit standing, there are other ways. Ways that involve less money and less interest. The ideal way to rebuild credit is by using credit but avoiding interest. This means purchasing something for $50 on credit and then paying it off as soon as the first statement arrives. Or purchasing groceries each month using your credit card and then paying it off before any interest accrues. Just remember my mantra: Credit good. Interest bad. Thanks very much for answering my question. 🙂 I did decide to go ahead and get the new PC. I took into account the risk involved in sticking it out with my old PC for another 6 months or more, and it just didn’t seem worth the wait for me. I had to put a couple clients on hold the past couple weeks because of problems with my current PC. I figure losing or upsetting clients is a bigger risk for me than paying $350 interest over the course of a year. If it wasn’t for your great blog, I probably wouldn’t have even thought twice about making this purchase, or even checked how much the financing would cost, for that matter. So thank you for helping me to make some adjustments in my oft-chaotic financial life.